One of our biggest assets as DC wedding photographers is our love of learning about different cultures. We come from diverse backgrounds ourselves and have significant international experience. For those reasons, we love learning about the specific traditions that make each Washington, DC, area wedding unique and special. We feel very fortunate to photograph weddings in metro areas that are so culturally diverse. Washington, DC; Baltimore, Maryland; and Philadelphia, Pennsylvania are wonderful melanges of different ethnic, religious and linguistic communities. With that in mind, this particular Washington, DC, area wedding was an absolute joy for us to photograph. The groom was Nigerian. The bride’s family came from neighboring Benin. This meant that we got to witness (and capture on film) a beautiful blend of two unique West African wedding traditions. For example, their Catholic wedding ceremony at St. Mary of the Mills Catholic Church was conducted in both English and French. The bride, the groom, the wedding party, the bride’s and groom’s families and all the invited wedding guests also danced in the church as the choir sang French wedding songs. Even for Pete, who has lived in a different part of West Africa, the ceremony was a delicious new experience. Guests at Nigerian weddings will typically approach the bride or groom (or their family members) on the dance floor during the reception. They will then either throw money at them or “pin” it to their head or chest before letting it drift to the floor. The purpose of the gesture seems to be twofold. First, it is meant to offer blessings and well-wishes (and cash, of course!) to the newlyweds. Second, it is a way to draw attention to and enhance the social standing of the gift-giver. Interestingly, a similar (but presumably unrelated) tradition exists in weddings celebrated in Poland and Ukraine. For a Washington, DC, wedding photographer, the money spray ritual was an absolute treat! Not only was it fun to watch, it also looked great on film! Pictures of the bills, whether still stuck to the head or chest of the person dancing or fluttering through the air, are always stunning. The notes also add visually pleasing background elements to images of brides and grooms getting crazy on the dance floor. 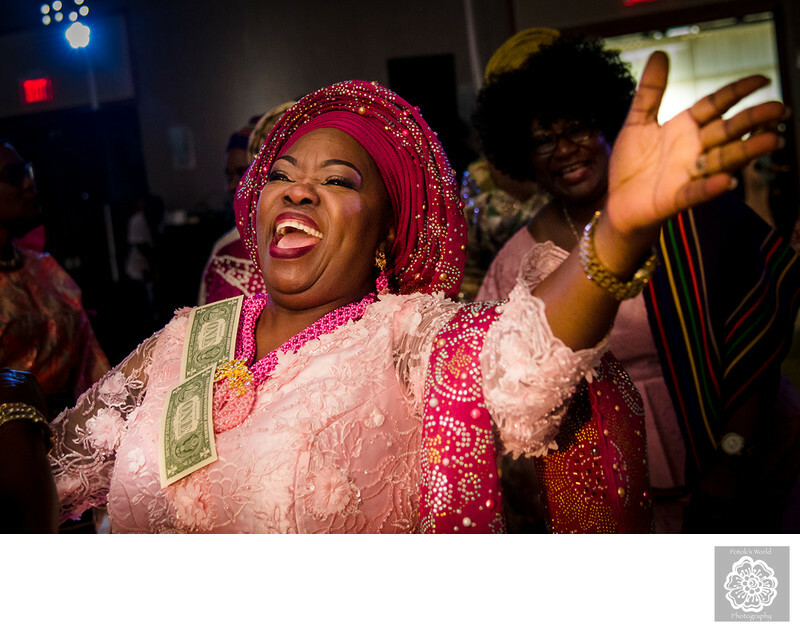 The green of the money often contrasts nicely with (or complements) the vivid colors of the traditional Nigerian clothing that many of the wedding guests wear. With that in mind, we already cannot wait to photograph another Nigerian wedding in the Washington, DC, area!